Mechanical clock movements can be tricky. From mounting to pendulum use, here’s a list of the 10 most frequently asked questions about mechanical movements and their answers. What does each of the weights do? Answer: As you are standing in front of your clock – the left weight runs the hour strike. The center weight runs the time and pendulum. Last but not least, the right weight runs the 15-minute melodies. Where does the heaviest weight go? Answer: As you face the front of your clock, the heaviest weight goes on the right hand side. This is true for all Hermle clock movements. 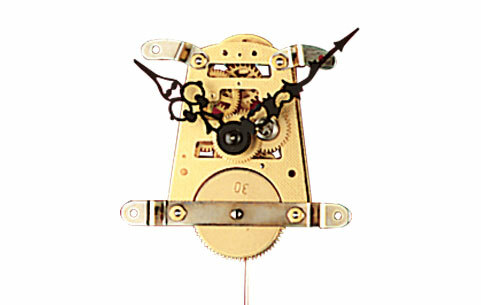 However, the Kieninger 06K Cable-Driven, Triple-Chime Mechanical Clock Movement places the heaviest weight in the center because of its automatic sequence option. Why does the middle weight drop faster than the outer two? Answer: There could be several reasons this is occurring. If the chimes are turned off, the two outside weights do not move down until the chimes are turned back on. It could also be that the chimes are not working properly because there may be something wrong inside of your movement. In that case, we recommend you talk to our mechanical technician: 1-800-556-2548 ext 4821. What’s the difference between front mount and rear mount? Answer: Front mount means the clock movement will be attached to the front of the inside of the clock case behind the dial. Rear mount means the clock movement will be attached to the back of the clock case. How do I correct my clock from chiming 5 minutes early or late on the quarter hours? Answer: When your clock is chiming, carefully remove the minute hand from the clock. On the back of the hand you’ll see a bushing. Using a pair of pliers, turn the bushing on the back of the hand so that when the hand is put back on, it’s pointing directly at the number 3, 6, 9, or 12. Why is it important to stop my clock before I go on a trip? Answer: If you don’t stop your clock before going on a trip, the weights will go to the bottom of the clock case. As a result, the pendulum slows down to a stop and gets out of beat, requiring a beat adjustment when you return from your trip. The hand nut falls off and if I tighten it down, it stops the clock. How do I fix this? Answer: Remove the hand nut and minute hand from your clock, and check the hour hand to make sure it’s pushed far enough toward to the dial so that at least 1/8″ of the brass shaft it’s on is coming through the top of the hour hand. It’s important to not count the threaded part at the tip of the shaft as part of the 1/8″. Once you have repositioned the hour hand, put the minute hand and nut back on. If the hour hand is too tight to go on any further, remove the hour hand and file out a small amount of the hole. There may be excess paint in the hole making it too small to fit correctly. Be careful not to file too much out of the hour hand, as it still needs to be a snug fit. Can I wind my clock movement more than once a week? Answer: Yes, you can wind it daily if you want to! I have a movement with a 94 cm on the back and I want a longer pendulum. Is that possible? Answer: Unfortunately not. If you put a 114 cm long pendulum on a clock that is meant to take a 94 cm pendulum, it will the run hours slow each day leading to incorrect time. And vice versa. If you were to put a short pendulum on a movement that needs a long pendulum it would run too fast. Can I use my own pendulum for the Hermle 451-030/66cm Mechanical Clock Movement? Answer: Unfortunately not. The only pendulum we recommend using with the Hermle 451-030/66cm Mechanical Clock Movement is our 22-1/4″ pendulum with a 7″ swing. See details of the recommended pendulum here: http://www.klockit.com/products/sku-19005.html. Do you have a question that’s not listed above? Ask your question by leaving a comment below or call 1-800-556-2548 ext 4821 to talk to our mechanical technician. My Hermle clock needs oiling. What guidance can you give me? Hi Al, which Hermle movement do you have? There should be a number on the back of the movement. My Hermle mechanical movement will not chime. I’ve cleaned and oiled it and it will chime for a couple hours then nothing. The hammers are clear of each other also and I’ve tried to set the chime to different tones but still get nothing. The movement is about 15 years old but has been cleaned and oiled every three years. Hi John, thank you for reaching out. We’ll be in touch soon via email!